In a large bowl, combine 2/3 cup flour, sugar, undissolved yeast, and salt. Heat water and butter until very warm (120 to 130 F). Gradually add to flour mixture. Beat 2 minutes at medium speed of electric mixer, scraping bowl occasionally. Stir in vanilla and enough remaining flour to make a soft dough. Knead on lightly floured surface until smooth and elastic, about 6 to 8 minutes. Cover; let rest 10 minutes. Roll dough to 12 x 10-inch rectangle; place on greased baking sheet. Prick surface of dough randomly with fork; let rest 10 minutes. Bake at 425 F for 12 to 15 minutes or until golden. Remove from sheet; cool on wire rack. When completely cooled, spread Cream Cheese Topping onto crust to within 1/2-inch of edge; sprinkle with granola. 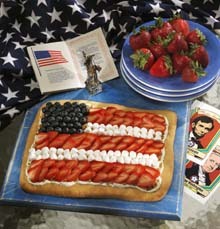 Arrange fruits and marshmallows over top to resemble the U.S. flag. Serve promptly after topping. Refrigerate leftovers. Cream Cheese Topping: In a small bowl, combine 1 (3-ounce) package softened cream cheese, 1/4 cup sour cream, 1/4 cup sugar, and 1/2 teaspoon vanilla extract. Stir until smooth.